Kind of a sad day around here last week as I watched my trusty old Chevy grain truck get loaded up on a trailer and hauled off to her new home in Owatonna. I had been perusing the want ads on Craigslist and ran across a guy looking for just such a beast. Since the old girl has been sitting back under the pines for about a year now without being started, I had been thinking of selling her for a while. That would take a bit of effort on my part to get her running and drive her up out of the weeds for a photo shoot. After emailing the guy, I found out that he basically wanted just her engine for a project truck he was rebuilding. He was a bit particular about making sure her engine was in the year range he was looking for and also that it had all the correct stock parts. Since I knew the original owner and also the second owner, I assured him that all was period correct with the truck. He even wanted a video of the engine running to make sure that it actually did. I had bought the beast from a neighbor when we lived by Mazeppa. Basically, just because the hoist worked and she had a lovely fourteen foot bed with sides. Her first job for me was as a moving van of sorts when we moved out to the farm in ’94. Made three or four trips hauling household stuff and shop equipment as I recall. Top speed of about forty five miles per hour made for slow and bumpy ride with her two ton rated springs. That was probably just as well with all the slop in her steering it was a real challenge to keep her going down the road in a straight line. Her brakes were nothing special either with much pedal pumping going on before any actual braking took place. I learned to anticipate stops and turns with well advanced downshifts. Over the years she hauled countless loads of gravel for our driveway, seed corn from the elevator to burn in our stoves, sand for our cement mixing projects, brush and trees from cleanup of the place, scrap iron to the recycling place in West Concord and I even used her as a scaffolding of sorts when I had to install siding on the barn. Due to her incredibly powerful hoist, there was never a load of rock or sand that she had trouble dumping when it was needed. 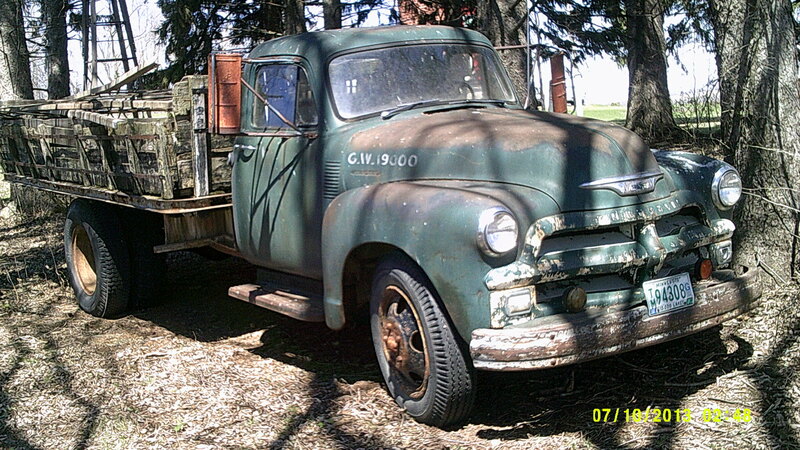 I can imagine that back in the day she was quite a handsome farm truck, but that was sixty years ago now. Time spent at our farm sitting outside for twenty years has not done her any good. I had to repair the wood floor of her bed and also the sides on numerous occasions. And a few years ago one of her rear axle bearings went out stranding me on the side of the road with a full load of corn. That little episode cost me about seven bills including a tow home and all new bearings, seals and brake shoes to get her back in working order. While I’m sad to see her go, it is probably just as well. Hopefully her new owner can salvage that wonderful inline six engine and part of her will live on.